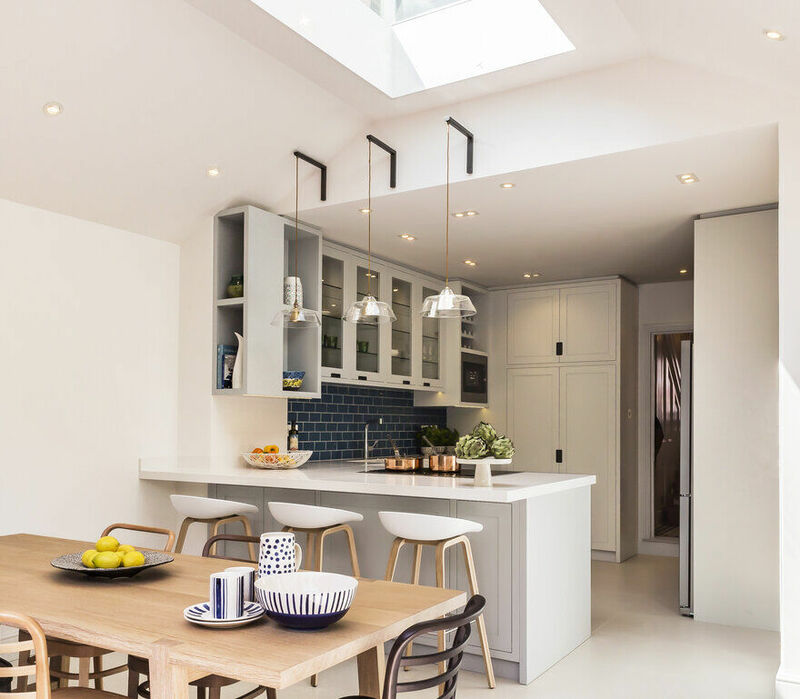 LLI Design have recently completed a total refurbishment of a 3 storey Victorian townhouse on a leafy residential road in Highgate, a desirable residential area of North London. 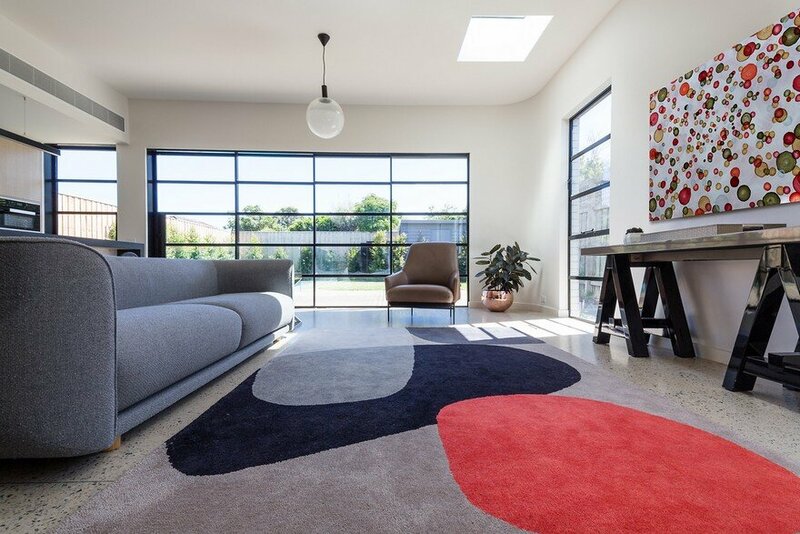 Our clients wanted to create a warm, comfortable home with modern touches. Although the house was in reasonable condition, the joinery and fittings throughout the house were dated, had been well used and looked tired. 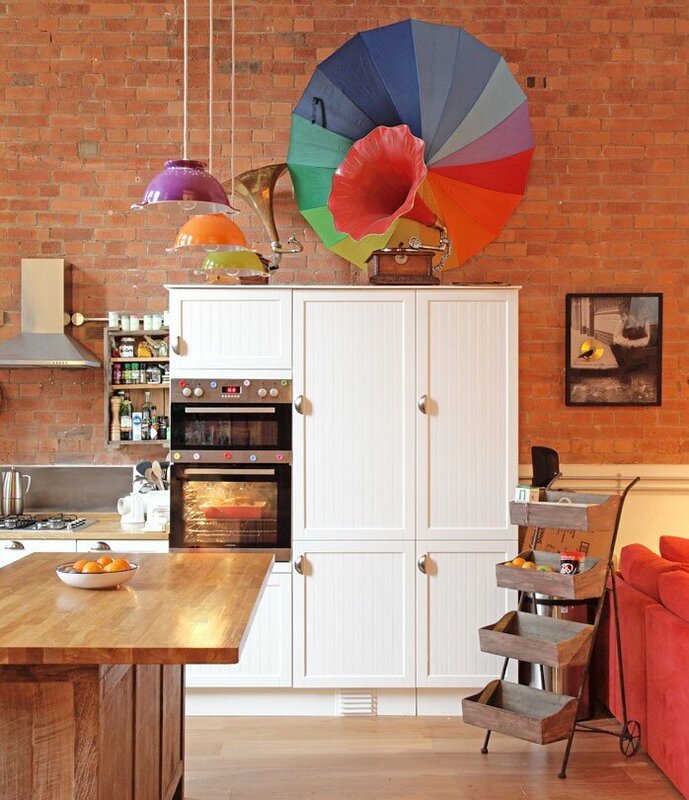 Many of the period features had been stripped out and those that remained had not been maximised. 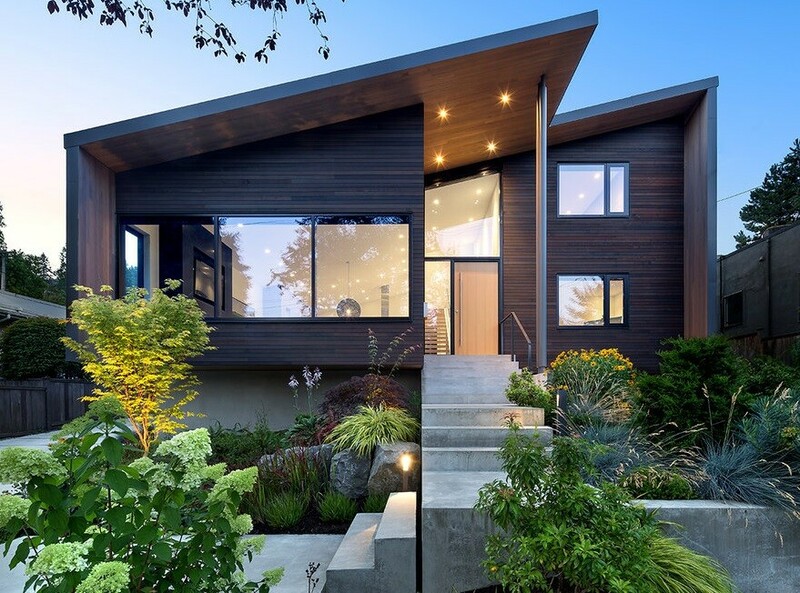 The house lacked character and personality although it benefited from ‘good bones’, nicely proportioned rooms, a delightful garden and a handsome exterior. 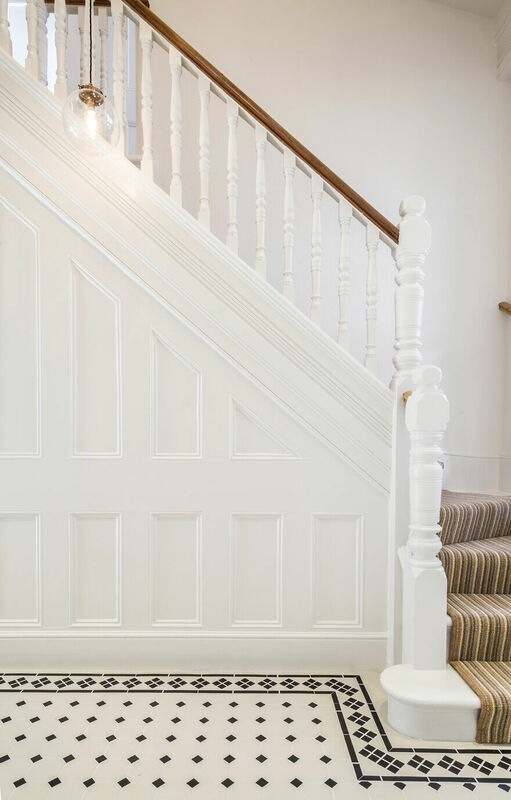 LLI Design felt that more could be made of the period features, enhancing some and reinstating others to bring out more of the Victorian feel of the property. 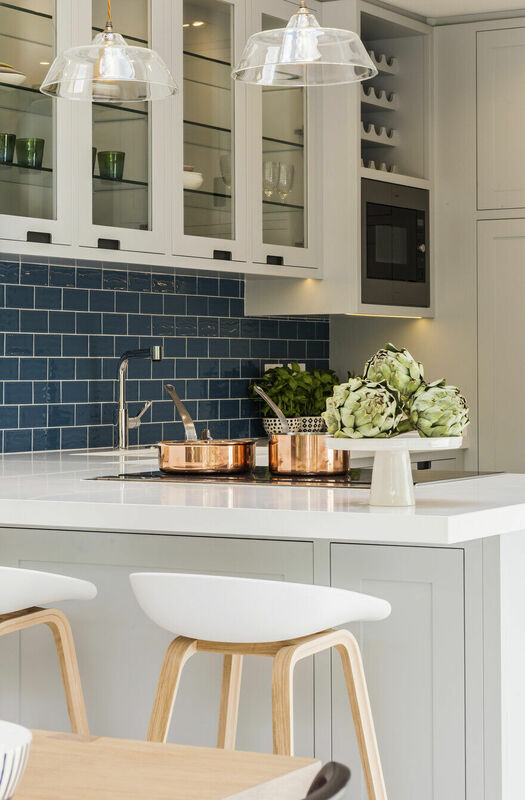 The brief was to create a warm, comfortable and welcoming home referencing and emphasising the house’s Victorian past as well as adding more contemporary elements to the scheme. 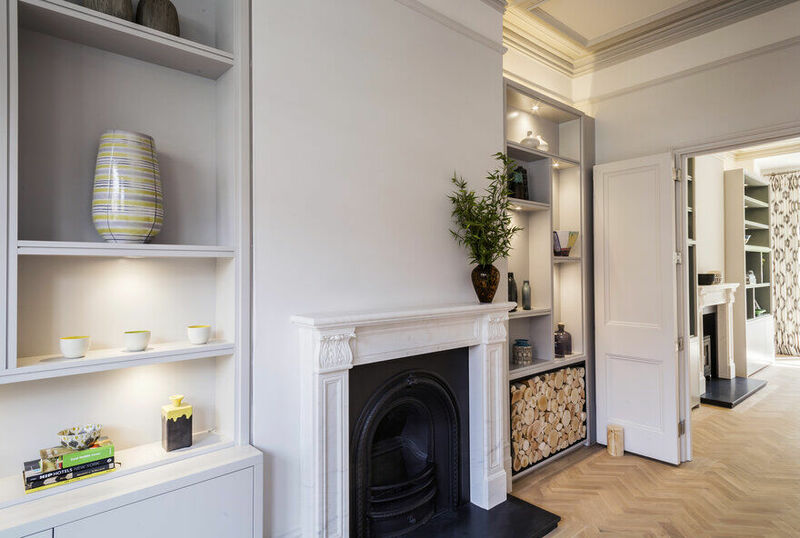 This Victorian Townhouse comprised of c. 2500 sqft / 230 sqm spread out over 3 floors including a cellar and a lovely rear garden. The ground floor comprised of a generous hall leading to 2 connecting reception rooms and at the end of the hall an extended kitchen. There was a small WC and stairs down to the cellar. It was decided to leave the cellar as it was and use it for additional storage. The first floor is divided into 2 bedroom suites. The Master Suite; comprising a good size principle bedroom with steps down to an ensuite and off the master bedroom, a small dressing room. 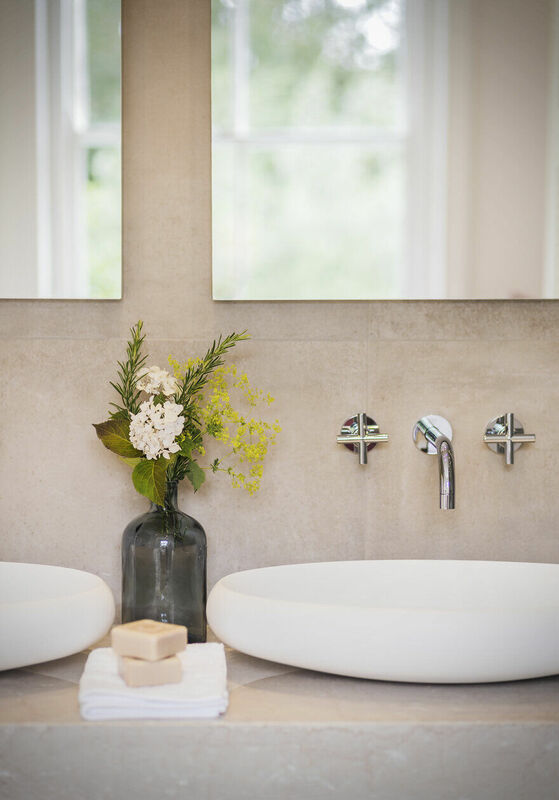 We created a Nursery Suite at the front of the house comprising of a sizeable bedroom and an ensuite bathroom. On the half landing up to the second floor is a kid’s bedroom and on the top floor a Family Bathroom, Guest bedroom and a generous Study Room. Although the entrance hallway was a good size it lacked character. 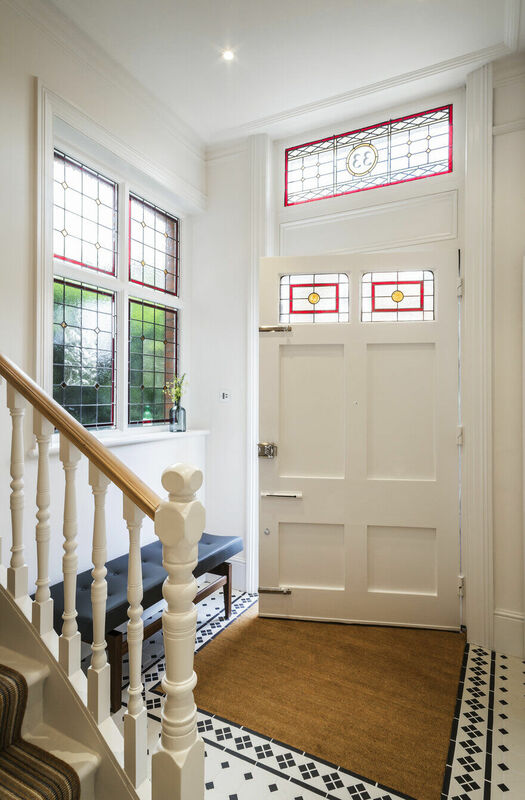 We reinstated the stained glass in the fan light window above the front door and side window, in a bespoke design, bringing light, colour and texture into the hallway. The original tiled floor had long been removed so we re-tiled the whole of the entrance hall in crisp black and white period tiles with a border pattern. 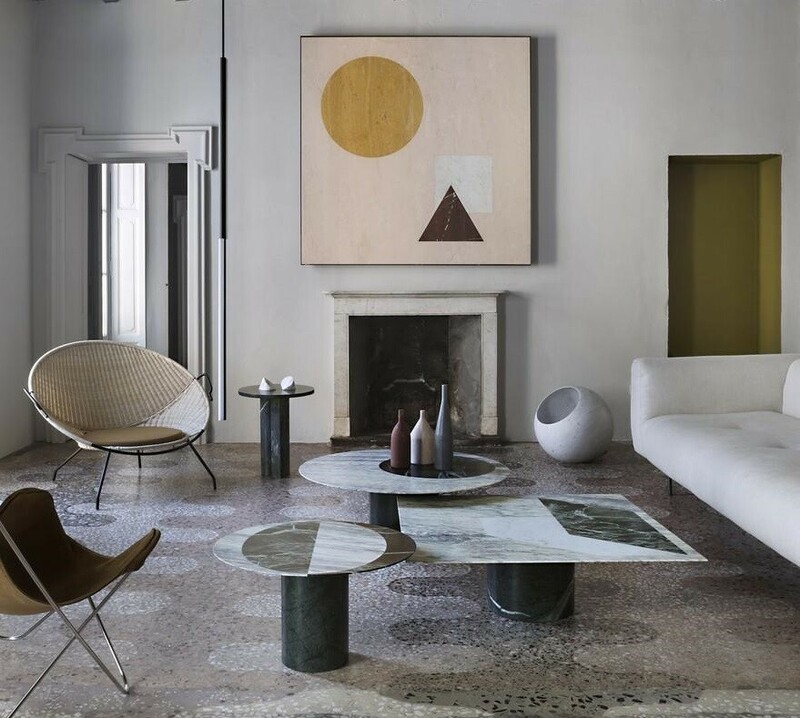 This immediately visually increased the size and lightness of the hall area. Considering the overall size of the Victorian Townhouse almost no provision had been given to coats storage, so as not to compromise the size of the hall we nibbled a small amount out of the generous dining room adjacent to the hall in order to create a generous cloaks cupboard. This created a small return in the dining room; so that this wasn’t visually intrusive in the dining room we ensured that the coving, skirting and dado detail wrapped seamlessly around the new return. The new return had the added advantage of creating an alcove for a sideboard, thus making the whole alteration seem natural. 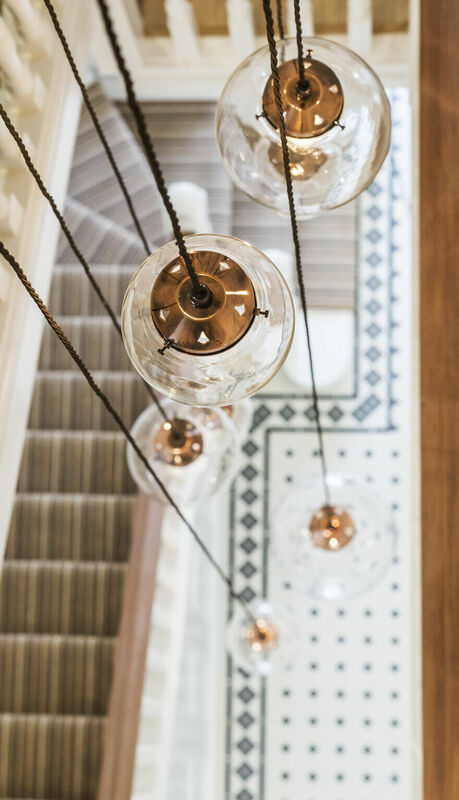 We commissioned Nigel Tyas to produce a dramatic copper and glass pendant light in the stairwell that hung from the top floor ceiling down to the ground floor, giving a visual connection and really creating a wow factor. 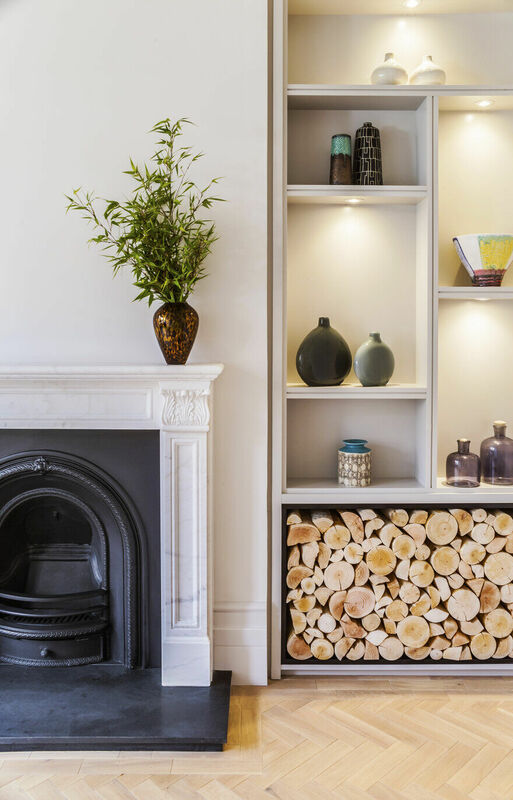 In the living and dining rooms we specified new light greyed oak parquet floors and traditional white marble fireplaces, in one of which we installed a wood burning stove. 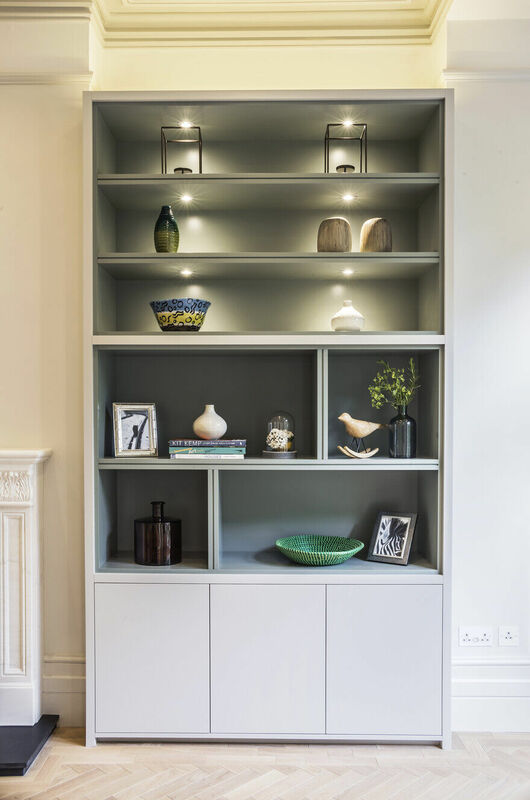 Bespoke pale grey lacquer joinery was designed and installed either side of the fireplaces in both rooms, incorporating plenty of storage, with asymmetrical shelving which we lit with individual accent in joinery spotlights. At the side of one of the fireplaces we incorporated a black steel log store. Both the dining and living rooms had the original ornate plaster ceilings, however they had been painted white throughout and were visually lost. We really brought this feature out by painting the plaster relief in close, but contrasting, tones of grey to emphasis the detail. The kitchen extension, although a good size, was rather dark, with a wall of folding sliding doors on one side at the back overlooking the garden. 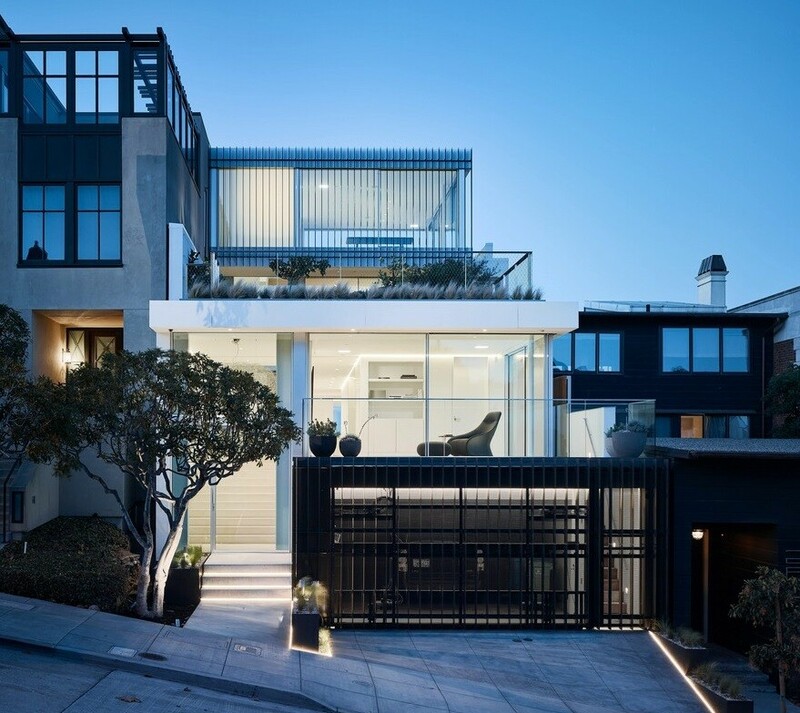 The architectural style was traditional and in keeping with the architecture of the Victorian Townhouse. 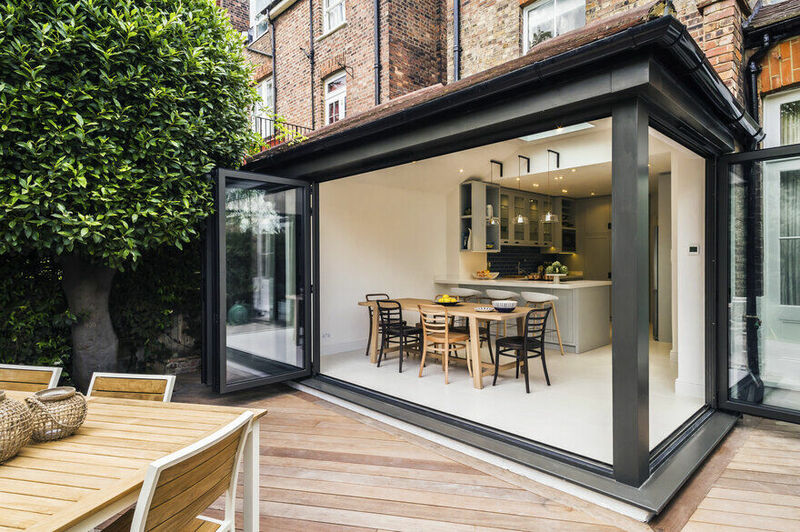 We enhanced the rear extension by adopting a contemporary aesthetic, installing folding sliding doors in dark grey aluminium on 2 sides, which allowed in copious amounts of light and gave a real sense of connection with the garden. 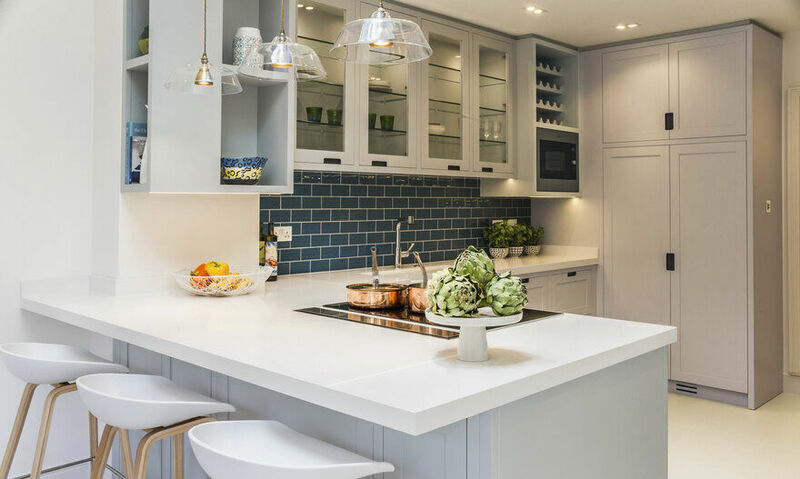 We redesigned the existing kitchen to suit the family. Creating a bespoke joinery kitchen in lacquer with walnut drawers and interiors. 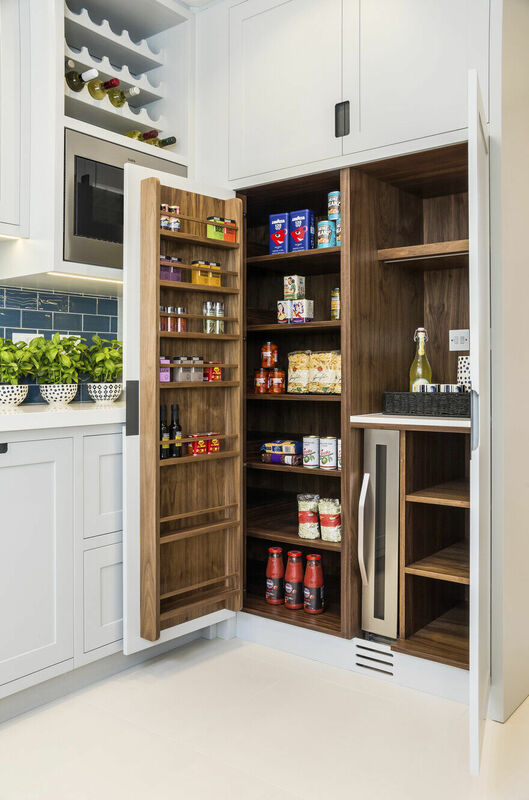 The styling is contemporary classic in soft colours with plenty of storage, including a generous larder and breakfast cupboard to house a kettle and toaster as well as a small wine fridge. Thus eliminating all clutter with everything being behind doors when not required. 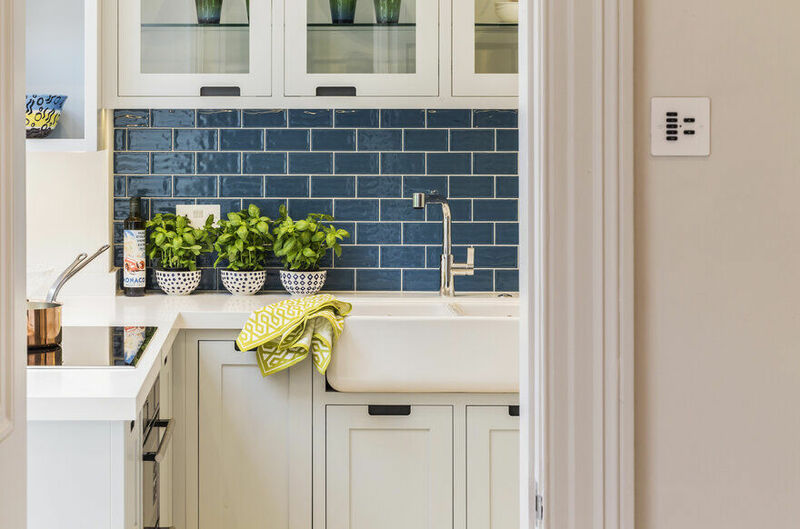 We specified a boston sink along with a composite worktop and added colour with ceramic deep blue tiles as a back splash. We designed and fabricated bespoke metal brackets from which to suspend 3 glass pendant lights which hover over the island below the glass skylight. 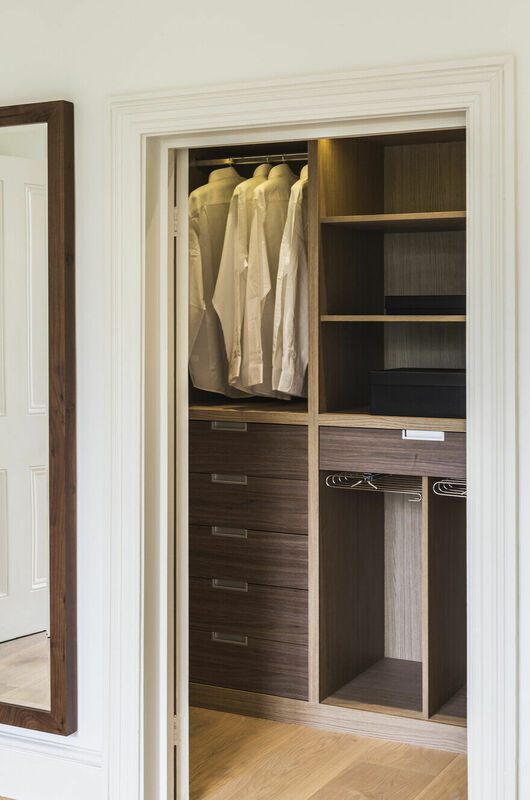 The dressing room was re-designed with bespoke oak full height units to make the most of the space. We stripped back and reinstated deep alcoves either side of the bed, giving them lacquer interiors and a shadow gap around. Delicate downlights in the shelves add interest to the room. An accent ceiling light was added for dramatic effect. 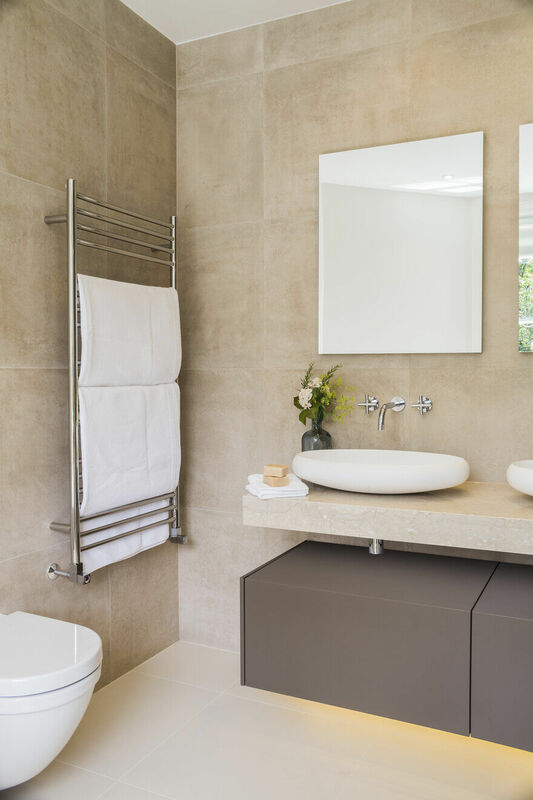 The master ensuite, which overlooked the garden, was re-designed and fitted with a large double wall hung vanity unit, with elegant composite basins on a thick natural stone shelf with a lacquer vanity unit underneath, wall mounted taps and double mirrors above. 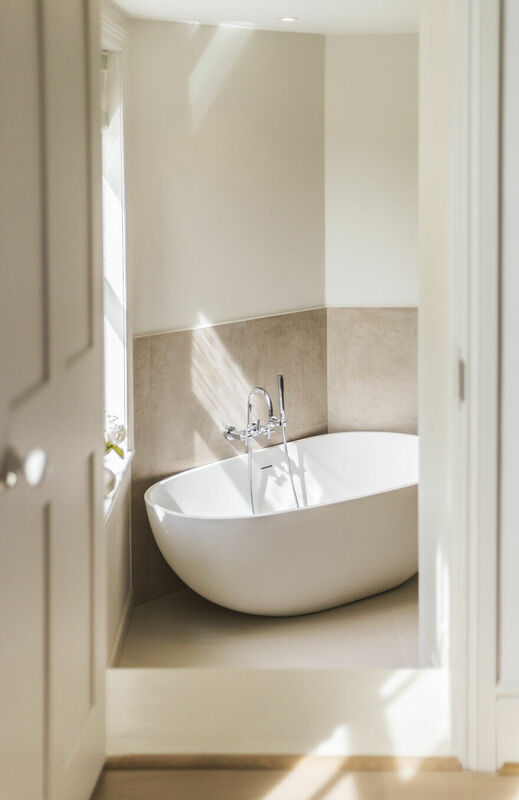 A sculptural composite free standing bath sits near the window. We specified a large matt tile for the floor, steps and walls, with a contrast ceramic polished narrow rectangular tile for the shower enclosure. Dramatic lighting under the vanity unit and in the shower alcove add to the sense of well being. 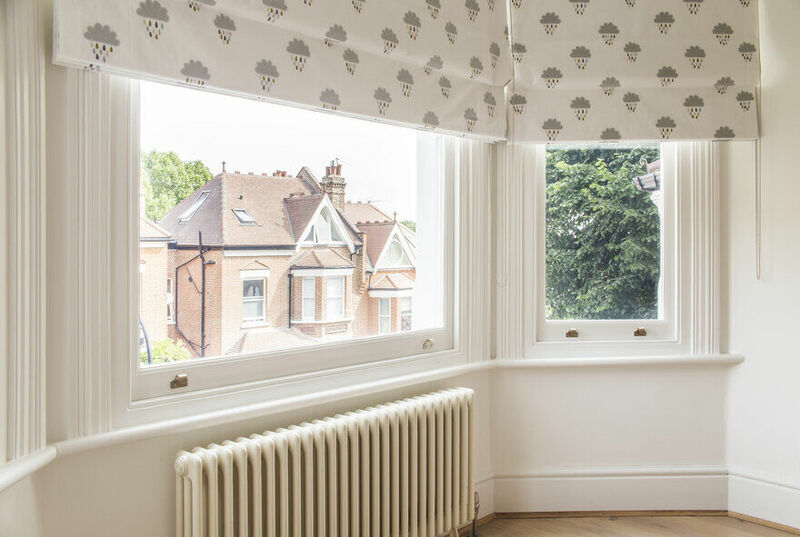 The Nursery suite was redesigned, with playful illustrated cloud roman blinds and a colourful watercolour dot wallpaper. 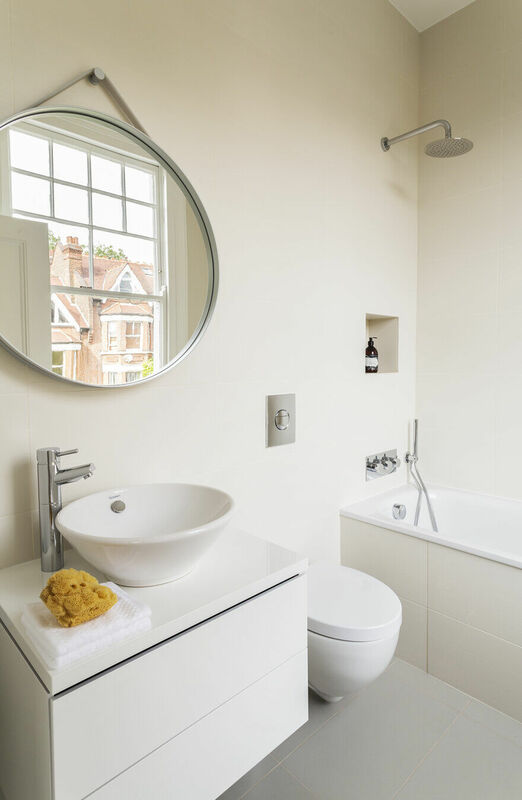 The ensuite bathroom was redesigned featuring a wall hung vanity unit with deck mounted basin and a bath with a shower over. 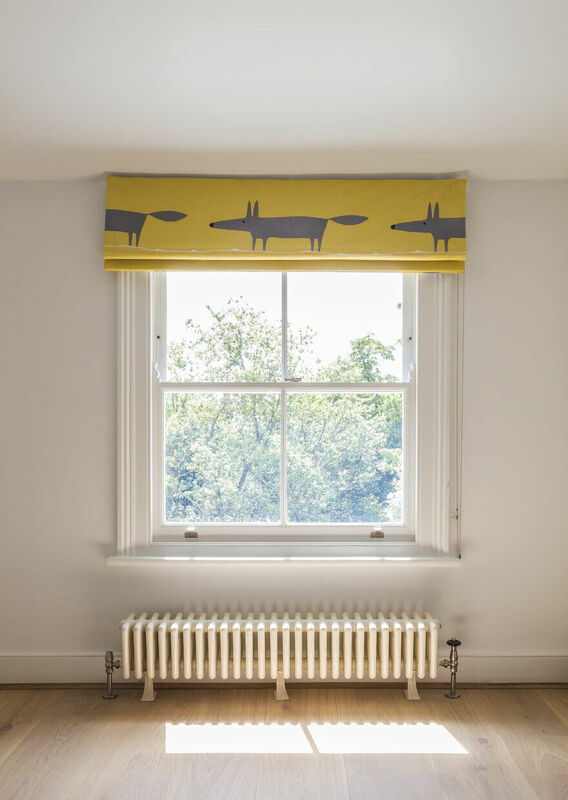 We created a fun playful childs bedroom on the half landing featuring a playful illustrated fox roman blind. To enhance the interiors a new lighting scheme was designed and specified including new fittings and garden lighting which adds the feeling of the garden and terrace being an additional “Outdoor room”. 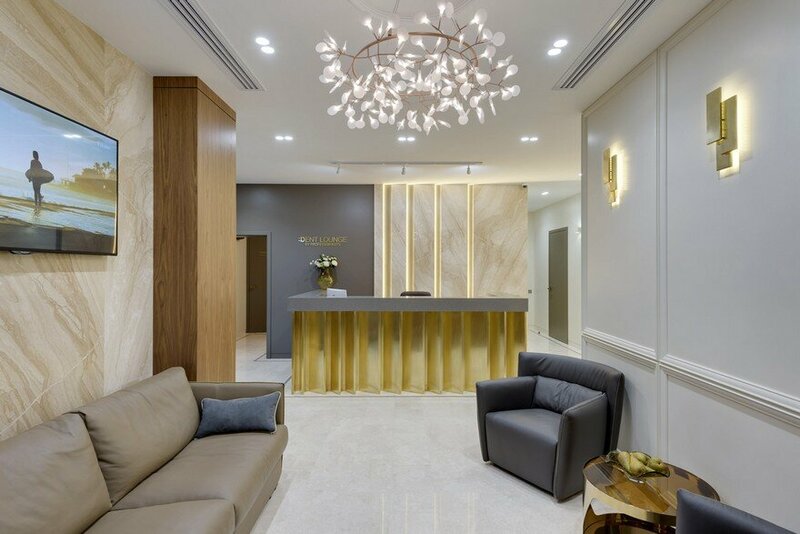 An Intelligent Lighting system was installed in order to create moods, ambience and timed events internally and externally, controlled from wall mounted keypads and also by iPads / iPhones.